Do you work for Wix? Learning about Wix? We can help. "No es una gran cosa"
El potencial que tiene en el SEO tanto por sus características como por la publicidad que pone Wix en multitud de sitios, hace que la web pueda estar bien posicionada, tanto gratuitamente como de pago, sirve muy bien para quien esté aprendiendo sobre SEO white hat y quiera poner meta etiquetas a los objetos de su web. Wix no es un servicio muy bueno en cuanto al hosting, está alojado en algún tipo de código, como Java, que tarda mucho, además de eso, también tarda de por sí misma en cargar la página web, algo que no es aceptable en un servicio profesional, por ello lo uso solo para pruebas de SEO. En cuanto al SEO es quizás el mejor page builder, ya que permite añadir los metadatos a casi todo, metaetiquetas a los objetos, etcétera. No es la mejor herramienta para tener un buen diseño, no cabe duda, pero para hacer pruebas, es decir, de banco de pruebas, sí que es útil, como otras alternativas también lo son. Con la gran oportunidad que ofrece para el SEO su sistema de objetos y meta etiquetas, es normal que aproveche el servicio para hacer pruebas de SEO, tanto white hat como black hat, al ser una web no oficial y que no nos va a penalizar los scrappers de los buscadores. Eso es lo que soluciona Wix para nosotros, un análisis del SEO en una situación simulada de la página web real. "A powerful web design platform with many built-in features"
Wix immediately sets the foundation for your website when you sign in. There are many sharp website templates to choose from with flexible editing capabilities. The interface and tools are straightforward and we don't need to have any coding knowledge to make changes. The websites we worked on were all optimized for mobile devices so that our website looks properly on phones and tablets. There are many great extension apps that let us add more features, like appointment bookings and purchase buttons, to our website. Wix is one of the leading website building tools, so I think it's worth taking a look at it for your basic web needs. If you're a more advanced web developer, this platform can possibly cause your more frustration than creating a website from your own server. I use Wix to create different websites for marketing, feedback forms, event sign up forms and other business purposes. It has been a smooth way for me to create and upload pages quickly. I've created simple one-page websites to serve as landing pages for email promotions or notices that I've sent out. The Wix booking app has given me a way to book appointments online without having to take time to manually process appointment and contact information. "An Excellent Option for Just About Everyone"
The Wix platform is constantly growing and innovating. Its intuitive editor makes it relatively easy for someone with a good foundation in what makes for a good site design (UX/UI) to do great work while not necessarily needing to write code. The platform offers lots of flexibility to make a site really fit the needs of a client or business. There are many templates available but you are also free to start with a completely blank canvas and there are no limits as to what you can create. There is not much to dislike about Wix. Like any platform and technology, in general, it's in a constant state of growth. As the platform and technology evolve there are some instances where things change and in some cases you find you want to adjust a site design to accommodate the new styling or trends but this is to be expected in any technology so shouldn't necessarily be considered a drawback. I would recommend that anyone looking for a robust web builder check out Wix. The days of coding a site from scratch or hassling with security breaches is a thing of the past. As a professional graphic designer who has used Wordpress in the past, I've moved over to using the Wix platform to build sites for myself and my clients. It's a great tool for designers who want to build beautiful, functional websites without having to do the tedious work involved in some other platforms. They offer extensive tools in the form of apps that combined with the possibilities offered by Wix code can cover just about every need. I dislike the advertisements that show up as a user who doesn't pay or as a free user but its only on the bottom of the page so its not too big of a distraction. i dislike how the free page also has to long of a URL mane and if you dont put the whole link the if will not take you to your site. "Easy to Use Even with No Tech Experience"
I'm not the best with technology, and when it came time for me to make a website for my small business, I wasn't sure if I would be able to do it myself. I found Wix and thought I'd give it a shot, and I'm so glad I did. Wix was so easy to use and had 100's of layouts for inspiration to get me started. I was able to customize everything easily and put my whole website together in a few days. The editing can be difficult. I wish adding text was easier as well as adding boxes or pictures too. Very easy and affordable compared to other similar options. There is a learning curve to setting it all up, but it really doesn't take long to get the hang of the software. It's pretty incredible that they were able to make designing a website to easy, so it's hard to complain about the little things that could make it better. I still can't believe I was able to design my own website and others who view my website can't believe I made it myself either. It provided my business with a website for a very low cost. It helped me connect my domain with ease, and I can edit my website anytime I want. "Good Platform For Software Building"
I had Great experience with Wix software. The software is very easy to use and is very helpful for non-programmers. It is easy to create a website as we get guidance at each step by Wix editor. I also recommend the software to my friends as it is free and easy to use. The software has limited themes and customization options are less. We have to adjust in the given layout and cannot change theme according to our requirement. I would like to suggest my friends and colleagues to use Wix. It is an excellent platform for creating a free website. Wix is an amazing software to build websites and blogs. I often use the software for creating blogs. Moreover, it is a free software to use and they provide us with the free domain that has always proved beneficial to me because I like to create new blogs. "Wix for webpages is the best tool"
Web accesible new feature is really nice. It is super easy to create your webpage without needing to know HTML. The little apps are cool. The offers they have are complete, cheap and renewal. They always have an option for what you need and give you like coupons when you buy them something. Little apps are cool but they crash sometimes. There was no "log in" button sometimes, only a "create account" in the main page. You will never be able to "talk" to a person of wix if you've got a problem, you have to use the forums and they will help you there. Ain't bad but different and sometimes you have to wait a lot or browse yourself for the answer. Use your imagination or use the already built themes wix has, they are really useful and easy to modify, you can also add apps -shopify, for example-, you just have to look up what you need. Get in mind that you will not be able to talk with someone if you need help, it's all about forums here. We created and have our website with Wix because we can modify it anytime we want without being charged like we used to when an agency took care of it. "I would recommend Wix to everyone"
I love Wix's drag and drop feature. It was my first platform and I don't think I would be where I am today if I hadn't used Wix first. It's incredibly easy to use, intuitive, and unlike many other platforms that offer just a template, you can customize and design your site to look exactly how you want it to. I can't think of anything I dislike about Wix. It really boosted me into learning about business and becoming familiar with creating a website. It doesn't have as many apps or plug-ins, but unless you're a company that has very in-depth processes, it meets any need you may have. I use Wix to showcase my portfolio when I am looking for new clients. I have had clients look at the website and compliment me on it. One in particular said it was "excellent." Holy smokes. I've seen Wix.com commercials on youtube before...alot. I've typically used Wordpress for my blogging, but when I wanted to add a professional looking business page as a tech non-savvy person, I went to Wix. It was so easy and user friendly! I like Wordpress, but I have to do alot of coding and adding my own stuff and sometimes I don't know where or how to put it and once I put it there I can't find out where 'there' is. Not the case with Wix! I can always find what I'm looking for and it even gives suggestions. The only thing that took me a little bit to figure out was how to get the Web version to look like the Mobile version...or I guess how to make the Mobile version to look right to my clients. But once I figured that out it wasn't an issue. Try and compare with what you are using now, that's what I did, and I found that Wix got alot more traffic for me and was easier to use. I have my own website, so I'm reaching my clients and my facebook page is linked as well. That's making it easier for them to see my specials and promotions and I am also on google. Wix is helping them find me! "WYSIWYG that is as strong as its designer"
That it is intuitive and easy to manage. The app market offerings grow by the day and offers a strong argument for using Wix vs Wordpress. They have completely overhauled their SEO Wizard which makes ensuring your onsite SEO is set up correctly as easy as possible. At the end of the day it does facilitate the ability for people to make their own website, but that doesn't ensure a quality finished product as some will simply change the copy in their template and don't take the steps to truly personalize the template and make it their own. In order to really have a polished site you need to have a clear idea of your website goals and the type of content and pages you need. Make sure you don't use more than 2 different fonts, and play with the template and make it your own. That will improve the look of your site dramatically. I work with small business owners and start ups who need to have the online presence of a website but do not have the funds to pay a consultant or agency to create their website. "No tan fácil como parece"
A pesar de que no es tan sencillo de construir una página web, Wix te ofrece funcionalidades y un menú directo para personalizar páginas y objetos muy útil, puesto que no tienes que perder tiempo en ir opción a opción, modificando cada una de las opciones en menús diferentes, teniendo que cargar varias páginas, complicándote cada paso que das, en vez de hacerlo todo a la vez y de manera sencilla, como en Wix. A pesar de su publicidad, de que es una manera sencilla, la verdad es que no es tan fácil ni rápido, tiene un mejor menú que el resto de productos similares, para los objetos de drag and drop, digo, sin embargo, para el resto de opciones en la web, tiene una mayor dificultad dejando de ser tan fácil de crear o modificar una página web para alguien que no sabe sobre desarrollo web. Si quieres solo rellenar plantilla y empezar, te puede servir. Debo tener página web y la uso en conjunto con otro producto similar para tener siempre una web online. "excellent application to make our website"
the wix solution is an excellent solution to design and build our web pages for projects that is my case. I and my partner were defining where to do it and we know that there are other portals that give you similar solutions but you should know a lot about programming and my area is not programming so we decided to go and try it. the number of templates that we have available adapted to each business model with predetermined and free images that we can use to design the most adapted and optimal to our market. the ease with which you can run the test and review the version of your web or mobile page. The support in the free version is very good, I hope that in the pay too. we have available ecomerce solution, data hosting, marketing and additional what is measurement analysis. I do not like that in the free version the url of the page always has the banner of wish ... but it is the cost to pay for the free. I recommend that you encourage them to try the free version, use the templates and perform the tests so they can see how it works and when they have their page closed do the upgrade so they have their own page. we solved the assembly of the web page we could do it to our liking without an intermediate developer and with all the benefits and benefits that we could have paid double with a developer. "free website builder , WIX is only thing you need"
The best part of WIX is easy to use, changes are effective immediately after publish,it has lot of templates to choose from so as to give feel of enterprise level website at zero cost . This has the power of customization the look and feel of the display UI. I would like to recommend to all the organisation to go ahead with wix so that they can benefited out of it and can reduce the development cycle of the website . as all the changes made to the website are deployed and published immediately as compared to whole cycle of development, design and deployment which make this tool super easy and handy to be used at any given point of time. This amazing website builder come with no of GUI based templated which can easliy plugged in to support the functionality you want to deliver to the customer in easy and quick turn around timelines. "If you want a very basic single language site Wix is not a bad option..."
User-friendly interface. Easy to use for anyone who has no coding background to build a beautiful website. I also think the monthly subscription fee is very reasonable. Customization is limited. Also I was hoping it can have inventory integration and shipping options offered similar to what Shopify did. Also it's slow to download the sites even if the images I put up on the homepage is small (under 300 KB). Also if you try to create a multi-language website, basically you have to manually create buttons one by one and delete the whole menu list. This creates a serious problem - you won't be able to see sub-menu items because buttons is just an element. You either click on it and it leads to another action. Also, your hamburger menu on mobile view will be gone since you delete your menu list. Your mobile view will look very backwards without the hamburger menu. If budget is not an issue to you, shopify is way better. 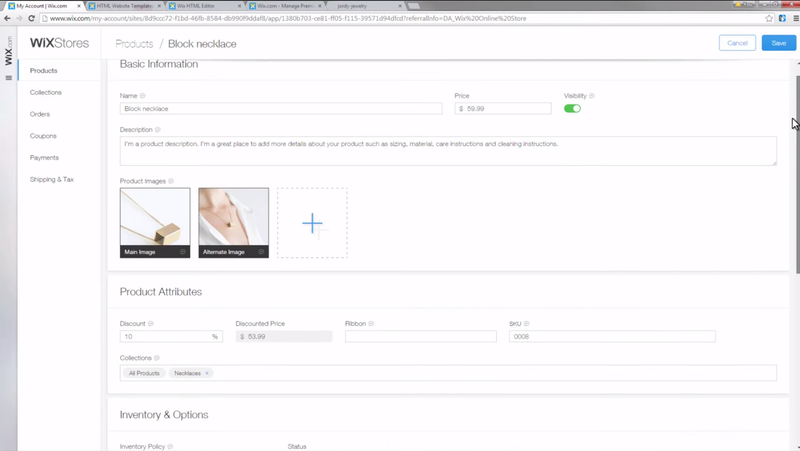 After realizing what limitations Wix has, I wish I chose Shopify to start with at the begining. I moved to wix from other platform (big cartel) because I want to have a built-in blog. Wix offers that. Wix offers all of the essential, basic website tools. It allows me to share information in an attractive way, and it comes with multiple user-friendly and appealing layouts with customizable options. It also has great free features. Wix can operate slowly. Loading and updating templates takes time, especially when compared to similar sites. I wish the layouts had better customizing options. I can change the details, but major components are set in stone, which doesn't adapt well with my brand. This site is fantastic for classroom-based activities and general classroom learning, especially due to the free resources it offers. It is slow, though, which makes it less practical for business use. Websites are difficult to make significant changes to, so be sure to pick a template you love before publishing. It allows me to share information with interested parties in a free, attractive, professional-looking manner. It's hard to reach customer support. You have to click several prompts and look at the bottom of the page to schedule a call from their support team-- they really don't make it easy to find! Wix is great, even if you don't know much about building websites. They have a lot of supplemental articles to help you out. I've had several clients who wanted a website created for them, still offer the ability for them to be able to easily make updates themselves in the future. Wix is a great solution for this need because it is so easy to use. The amount of features that Wix provides through their platform is amazing. I was using other design platforms before Wix and I am in love with their design platform as well as the amount of customization I can put into my website. I also like the apps you can add to the website which allow for analytics tracking and event management. They also provide great templates to use to help create awesome website features such as an easy to use FAQ page. I wish more of the additional features were included in the paid plan without having to pay extra. Use it for a high-quality website that is easy to design and easy to maintain. They provide ease of access to designing the website as well as awesome SEO instruction and advice. "Simple but just what I need." If you need something quick, dirty, and pretty, get Wix. It's simple. SUPER simple. Honestly, there's nothing simpler. No code, nada dealing with CSS absolute positioning. All good looks. Because it's so easy to use, it's also not easy for really powerful customization. There are better platforms for that - Webflow, Wordpress, etc. But I chose Wix because it was easy, so this isn't a personal issue for me. Go for it if you want ease; it's the easiest on the market. And the prettiest! I could get a pretty looking portfolio up stat. I was too lazy to design my own page on a moment's notice with code, as I'm a stronger designer than I am a coder, and Wix made it easy to slap a portfolio onto my resume. "It's good if you are starting on creating web sites"
When you start they guide you in almost every step. You can design a website as you imagine. Wix allows you to drag and drop elements and place them anywhere you want, it is highly costumizable because they have a lot of templates. Wix is completely free of publicity and that's a great pro for us. It is very easy to configure. You can start designing your web in a mobile device and then finish it later in a PC. Sometimes it takes a long time to fully load the content and that could cause that our possible and regular clients leave the page. If you need costumers support you can wait forever for them to respond and when they do it they don't solve the problem. Wix in long term is more expensive than the others main competitors. In conclution for your business requirementsthere there are other more ideal website builders. If you have never created a website this is an ideal option to start with, You do not need to be an expert on web programming and web design. But if you need a professional website for business you better look for other website builder. The SEO works acceptable, is not what we expect but it works in the end. Building a web site usually takes time but with wix you can do it a little bit fast because it's tools are very helpfull. "Intuitive website builder with basic and advanced features for any industry "
Easy to use website builder that's drag-and-drop but also allows some customization. The "smart template" option was a time saver. You fill out a short quiz and it matches you with a template that suits the type of website you're looking to build. 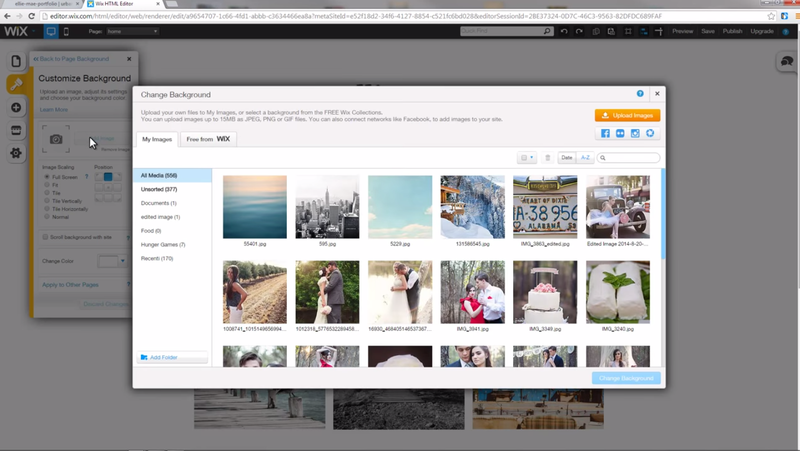 Wix offers many of the same features as other platforms but with a much simpler UI. The SEO optimization is actually pretty comprehensive and there's an extensive app market to fit any industry. You can even add animations to texts and images. Overall it's one of the easiest ways to build a small business website even if you have no website experience whatsoever. They offer great customer support and there's a large help center for common questions. The free plan is riddled with ads, but that's to be expected on a free plan. This is ideal if you're not too tech-savvy and need a good website that you can easily customize and edit when needed. Build a complete e-commerce website with minimal time and effort. "Setting Up My Own Wix Web Site"
Ease of use. For the uninitiated, seniors with less experience, young people and anyone with less than necessary experience in setting up a personal, professional looking web site, will be thoroughly comfortable in the Wix environment. Having experimented with Wix in a variety of browsers, while they all work, Firefox seems provide the most functionality. It's difficult to find things to dislike but I suppose, like Shopify, Wix could allow connection to a larger collection of secondary service providers. I've solved business problems for others in that Wix, especially for those that are just starting out with an idea or a very small business, is free to maintain. That a Wix site can be maintained for free, even in light of the inexpensive alternatives of Shopify and GoDaddy, can often mean the difference between success and failure. Wix also provides the added benefit of "Ease of Use" because Wix could be used to set up a rather professional web site even by elementary school children, and with ease. "Wix is the best and easiest online website builder "
I have been using wix for years now. First, for myself and currently for my various clients. Wix is amazing because it has so many apps and features and it very inexpensive and user friendly. The apps that wix has allows me to be able to create beautiful and functional sites no matter what field they are in. I have created stores, blogs, and much more. I think that wix should get a better contact system for site subscribers. Their shout outs are not as creative and efficient as they should be. Go for it ! Wix is great for all users no matter your skill level in design or coding. Anyone can use this platform because of its ease of use. It is also very cost effective and will allow you to easily create the site of your dreams. Wix allows me to create amazing sites for my customers, no matter what field that are in, at a reasonable price. The benefit of this is that the customer is able to make more money using their site and wix gets another "life" customer. None of my clients have switched to another platform from wix. They are the one to beat. I like the modern designs and templates that are offered by Wix and how easy it is to utilize them. There are a lot of color choices, design choices and font choices, and you can bring in any imagery needed. I dislike that I have to upgrade in order to cream a long form when in Wordpress I could just add HTML or a plugin to assist for free. The form only had a set amount of questions that I could create. There are paid options that are only available to premium users and that doesn't seem very fair. If you have idea of what you want and don't mind using a pre-formatted template, Wix is for you, but if you have HTML knowledge and want more customization, this may not be your best option. Getting an updated website up and running easily and using a pre-purchased domain. There are so many options of what to add to a website that the possibilities are endless, unless you need to really go in depth. "A good tool for your site"
This platform has a fairly intuitive interface, but what makes it radiant is the ready-to-release mobile version on the fly, which is built as you create your main website, ready for the browser. I can easily make a wonderful site. Creating without programming is really incredible. Very quickly choose a template, move any element in it, if it is acceptable, I can add my own texts, photos and the site is ready to use. Work in the mobile application should be faster. There is no built-in statistics function, and sites do not use responsive design in the strict sense of the word. Sometimes a site may be a little unorganized, and once you select the initial template, you can not change it. I use this platform to continue my resume, I was able to order a lot of freelance work. Everything that is on my site, easily configured with the help of the software designer of this platform, which will do almost everything. It was a good update from the site I built. I was able to turn my ideas into a strong "brand" site with an easy-to-use, fully customizable website. The number of proposed templates covers everything from business to resume on a personal website. I would highly recommend using this platform. Much easy to configure, modification, delete or add every element to min site. I have the opportunity to work with a big assemblage of the supplement will help us in making and contribute our website. I'm glad that I have the huge ability to use useful tools which will help me to do unique pages. Better to edit and run the single-page pattern. I will not complain about that software as I don't see a strong problem which can harm all my working process. Also, I never have the delay in the connection. With this software, you will find everything that you need for your company. I can say that you will know everything about your contacts list, customers or recorded users and keep them in one place which convenient. Also, you will have the opportunity to control all your working process. You will have the better chance to create the most comfortable and beautiful website. We can do process and edit our photos for better results. Add a menu that will help visitors simply manage via bookmarks-anchors posted on the website. Also, much easy to track orders and get payments with no problems. I love how simple it is to use, however, you can still make it more complex and intricate. It is a perfect website platform, regardless if you are a first-time user or have a lot of experience with websites. I dislike the transfer from desktop to mobile view. It is a bit complicated because some features you worked so hard for on your desktop view are useless. For example, you can spend hours on your desktop view but then when you make the automatic switch to mobile view, certain features don‘t make the trip over. Unfortunately, all that work has then gone to waste and you‘re left with a great desktop view and an okay mobile view. I would definitely recommend Wix because it creates wonderful images and interactions with its users. I am hoping to take my soccer blog off the ground. I have also used Wix in the past for a personal trainer blog and website. It is a great platform used to be as interactive as possible with your clients. It is extremely easy to use and fun to work with! "Easy to Use and Great Answer Sections"
The system is built for ease of use and does not require an extreme knowledge of website building to use this web design site. If you do have any questions about any of the design features, the help section offers step by step guides about how to use each feature which adds to the ease of use. It is not a great if you want to use code. While it does offer a way to add coding to your site, it is not built for that advanced of coding. We were able to build a functional website for our customers and one that looks great and sets us apart from our competition in town. "simple and quickly works, flexible pricing, automatic backup." Wix is a simple easy to use option for simple and quick jobs. It offers quite flexible pricing to suit your needs. Wix has an app market which allows you to add apps to your website. It has an automatic site backup. Wix is not an SEO friendly platform. Although it offers number of themes but they are difficult to alter in future once you are done with your designing and your site goes live. Wix does not support data export option either. Scaling website can be tricky at times. Wix’s artificial design intelligence offers you to relatively smart assistant to help you in creating your website. The apps you add to your website from the app market can very easily be integrated with the website. "Excellent Tool for the Novice Website Designer"
I myself am in the process of learning code, but it honestly bores me. The beauty of website design for me is the actual visual design. I utilize Wix on a regular basis to make fast, yet beautiful websites that are easily updated and manipulated. I wish they had more add-ons/ apps. I have run into situations where I want to add a functionality to the site and are restricted by what they have to offer. If they expanded their app library, this service would be perfect. If you are looking to create a beautiful website, quickly and would rather focus on design rather than programming, this is for you! I use Wix to created websites for my freelance clients. To date, I have created and maintained 6 websites. The ease of use allows me to turn over the websites to my clients so that I am not always called upon to update. Across the board, all of my clients have been pleased. "A very useful and simple tool to create a website"
Wix gives users the ability to create website accordingly to their preferences. It also has many nice looking templates for those who prefers simplicity. Even though Wix is a great tool, it can be very slow, especially when I try to add more gadgets, functions, and photos to the page. Wix is a very useful and simple tool for anyone who wants to create a website whether it is business, classwork, or personal related. It's not hard to figure out different features that Wix offers. It's fun to play around with the tool and get nice results. The business was lacking an online presence. It's a quick, free, and simple solution. Wix offers different payment plan with benefits for users to choose from. The company that I was working is a small company so I was an;e to pick an affordable plan. "I love wix for website building"
I have used Wix to make three websites, one a travel blog, and two for photography businesses (my own). It is great having templates for free to choose from. You can build a site in a day! The customization can be limited when using a template, it is easy to mess up the whole ascetic when trying to change one simple photo or it ends up being too complicated to change a page within your site as well. I do not pay for my URL so I hate seeing Wix before my page name. I also wish that Wix would keep your page looking the same no matter how large your screen is, sometime when you pull the tab larger or smaller it skews how your page is set up. This makes it hard to keep your site looking professional. Have the images that you want to use on your site ready and copied into a folder. Have a clear idea of the site you want to build before jumping in. Remember what your target is when building your site, is it to drive business or just to present your work on a site? "Wix allows you to easily create a website yourself"
The first thing I want to say is to create a website very easily using Wix. The program has a large number of templates, which you can choose exactly to your wishes and change any element in it. The support service does its job very well. Since I created the site for myself, I lacked all the functions of this program, but if I made sites to order, I would like more possibilities. If you need a website and do not know how to do it, or who will ask for help, I can definitely recommend this program because using Wix site is created simply, you just need to choose a template, add your text, video, photo and everything is ready. I could not even imagine how easy it is to create a website. I used to think that the site is created only by programmers for a large amount, but thanks to Wix I created it myself. A large number of templates helped me choose to create such a site, which I always dreamed of. "Very useful - some issues but most are small things I can deal with"
Drag-and-drop, tons of apps and extras (spreadsheets, bookings, blog option, embed HTML, etc) easy to change any little thing, user friendly, has their own step-by-step instructions for almost everything. 1. Sometimes it doesn't save my changes, and then I lose my work. I think it should auto-save like most cloud based stuff does. 2. the Email (shoutouts) is a problem. It doesn't save my work and I've lost more newsletters than I can say. It's hard to customize and it isn't as versatile as it could be. 3. there are lots of drop-down menus on the header, and often I'll go to click something and the drop-down will get in the way and I'll click it. It's extremely annoying. Save your changes often, make notes, watch tutorials, and don't be afraid to make "practice" websites to give yourself a chance to experiment. There's more there than you think. I can do EVERYTHING on Wix rather than having to do some stuff on one site and some stuff on another. Highly convenient to do everything in one place. I love Wix because it has a large number of templates to show a professional aspect to any project. The best part is that you can customize the web page design easily with just a few clicks. Add images or multimedia content to the website from this platform can be a bit annoying as you need to take several steps to upload the content. It is highly recommended to use this platform for companies with low budgets and for individuals who want to start an online project. Wix has facilitated the creation of different websites at a very low cost, being able to reduce the expense of creating micro websites to improve the content of our brand. "Wix made it easy for us"
The ease of use! My husband and I were able to bootstrap our first business website with no prior experience in design or coding. Wix made it possible for us to create a professional website at a much lower cost than it would have otherwise. It's honestly hard for me to think of something I dislike about the platform. It did everything we needed it to do at the time. Just spend time getting to know the platform and customizing it to what you want. Once you understand how to use it, it is very easy to set up a website. The business problem we solved was that it allowed us to create a professional website at a time when we were just launching our business and didn't have the start-up capital to have it done professionally. Wix was so easy to use that we were able to create something quickly that looked great! 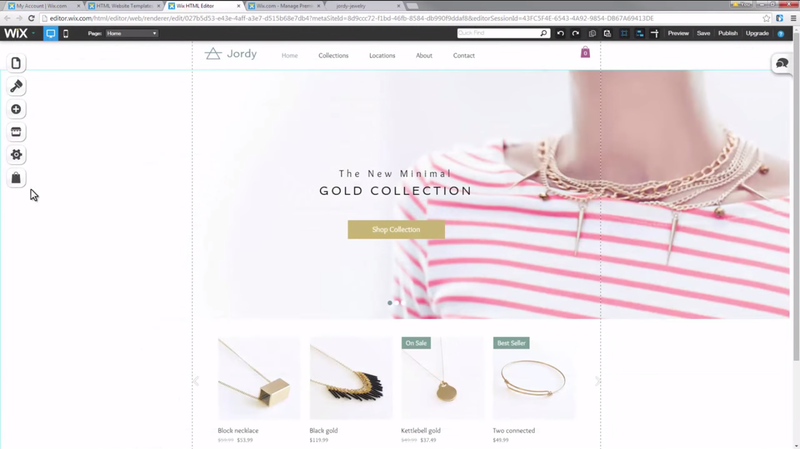 "Wix is easy to use, clean, powerful, and makes beautiful websites." I love how Wix makes building an elegant, professional website easy. No previous website design experience is necessary. I was able to connect my personal domain name and Wix takes care of all the hosting. I dislike the way the site dashboards are laid out. It is difficult to navigate the various features, and finding things like site traffic is non-intuitive. Make sure to set up traffic tracking early, since it only tracks from when you set it up. And make sure the mobile version of your site is set up how you like it - Wix tries to auto-populate a mobile design based on your desktop site, and it does a poor job. We use Wix to host our website and portfolio. Currently, the amount of traffic our site receives is small, but we know that Wix will be able to support increased traffic in the future.